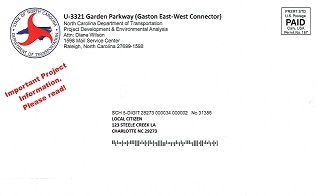 (May 9, 2016) The North Carolina Department of Transportation (NCDOT) has notified the community by postcard that all activities for the Garden Parkway have stopped. The Garden Parkway was planned as a toll road that began at the current interchange of I-485 and West Boulevard in Mecklenburg County, crossed over a new bridge spanning the Catawba River, and continued around the south side of Gastonia, connecting with I-85 to the west of Gastonia. The Garden Parkway had been evaluated as part of the state's Strategic Transportation Investments processs, which uses quantitative scores to determine what highway projects should receive funding. The Garden Parkway scored poorly and moved down on the list of potential projects. The local Metropolitan Planning Organizations removed the project from their 10-year Metropolitan Transportation Plans. The processes that have ranked the Garden Parkway poorly are the same processes that have ranked two Highway 160 projects high enough for the state to include them in the 2016-2025 Transportation Improvement Program (TIP) and has ranked a third project high enough that it may qualify for the next TIP. See Your Comments Show Support of Funding for Highway 160 Project. Two development companies, Lincoln Harris and Crescent Communities, are planning a new mixed-use development tentatively called River District that will cover over 1,300 acres in land west of the airport in the area where the Garden Parkway was supposed to go. They have prepared draft plans that do not incorporate a major parkway. They have, however, planned for a thoroughfare that might evenutally lead to a new bridge across the Catawba River. Gaston County planners are discussing a possible road/bridge connection in that area. For more information on the proposed River District development, see Neighbors get a closer look at River District west of Charlotte airport (Charlotte Observer, April 27, 2016) and Rezoning Petition 2016-056. 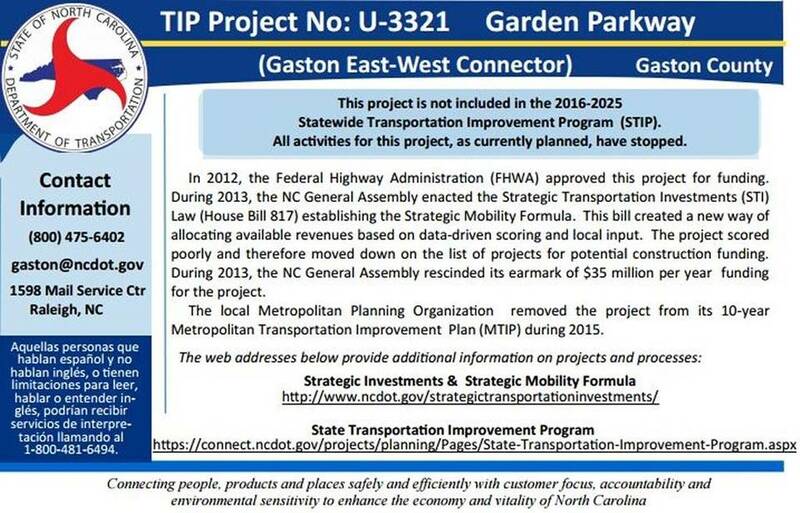 Also see In a postcard, DOT tells Gaston residents the Garden Parkway is dead (Charlotte Observer, May 9, 2016).